Military technology has driven lots of the world’s coolest inventions, and soon it might bring us futuristic sunglasses with augmented reality display overlays. DARPA is currently working with eyewear company Vuzix to develop a unique set of goggles for military use that will allow a single ground troop to control unmanned or manned aircraft in the air and order air strikes. 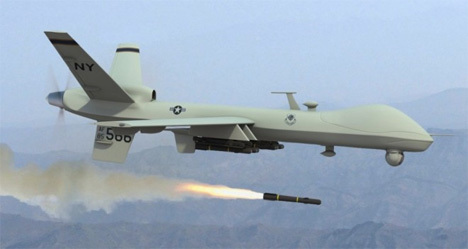 Having a troop on the ground to identify targets will dramatically cut down on civilian casualties that often occur thanks to incomplete information being passed between ground and air troops. But the troop wouldn’t be entirely alone: his heads-up display would give him all kinds of additional information about his targets and the surrounding terrain. Head-tracking technology would follow where the soldier is looking and let the attached computer see exactly what the soldier is seeing. It would be just like having an entire team of tacticians and analysts right there on the field along with the soldier at all times. Not all of this technology is entirely new, but currently providing this kind of power to a ground troop would require a huge battery that would weigh the soldier down and be extremely conspicuous. With the proposed goggles, troops would be able to walk around without drawing suspicion, looking like regular people wearing regular sunglasses. 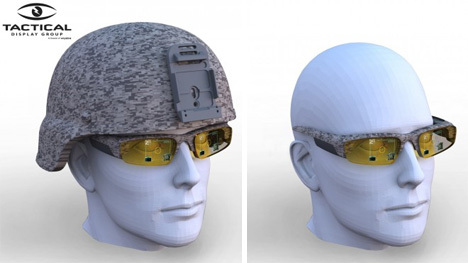 Hear about some of Vuzix’s plans for the civilian side of this technology in the video above. In the future, their AR goggles might just mean that we can walk around with virtual tour guides. See more in Unbuilt Concepts or under Technology. April, 2011.